Star trails swirl over three smiling jack-o'-lanterns in this night-sky photo by amateur astronomer Gowrishankar L.
Happy Halloween! 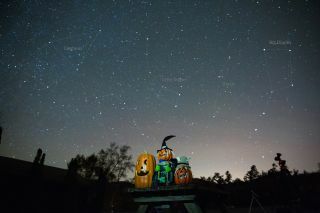 These stargazing jack-o'-lanterns are a sign that at least one astrophotographer is getting into the holiday spirit. To create this stellar view, Gowri captured 30 photos of the night sky, pointing his camera toward the north. All 30 photos were taken with a 30-second exposure time, with another 30 seconds in between each shot. When Gowri later stacked all of the frames in Photoshop, the star trails appeared as short, dashed lines around Polaris. Gowri shot the images using a Canon EOS 5D Mark III DSLR camera and a Canon EF 100-400mm f/4.5-5.6L lens with a 2x extender.